User-centric: optimising design for the understanding, behaviours, and physical capabilities of the intended users. Unfortunately, engineering-centric, marketing-centric and business-centric design can just come across as thoughtless design. I’m typing this from a hotel in Sydney. 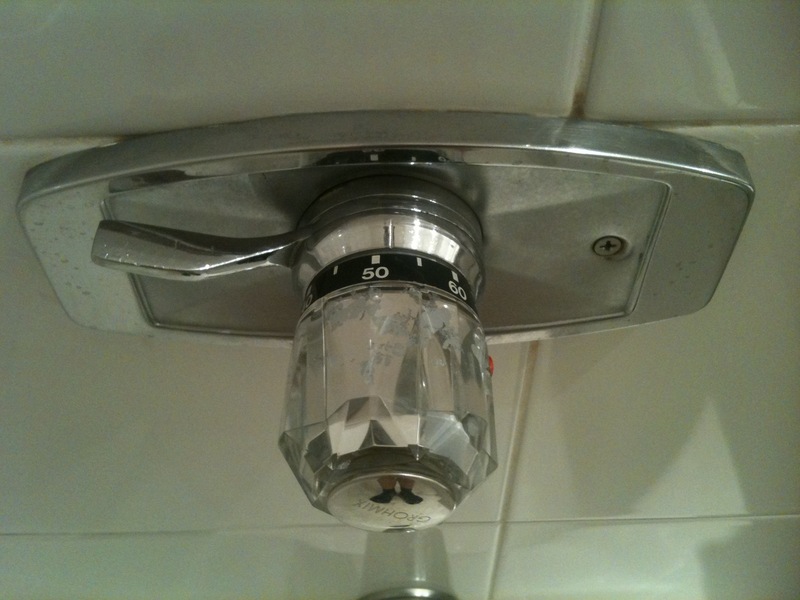 In the shower is the tap fitting you see above: an example of thoughtless design. Take a moment to reflect on how you think it may work. Right or up are positive: forward, future, or increasing. Turning a tap clockwise closes the valve. Moving the slider to the right increases the flow of water. If someone enters the shower half-asleep, turns the tap anti-clockwise and no water comes out, they may try moving the slider and end up scalding themself. Moving the slider to the right increases the water temperature. The worst part is, a user that gets scalded would probably blame it on their own incompetence – instead of complaining to the hotel about the thoughtless design. I’ve since been told by @Aus_Pol that this type of tap fitting is common in certain parts of North America. Specifically, he’s seen it in “4 different places of Canada (and Seattle).” Personally, I’ve only seen it in a couple of places in the States, including Maryland and I think, Texas. After having to use the shower again, I noticed something else. The potential issue of someone burning themself due to the thoughtless design contravening user expectations has obviously been encountered by the designers. 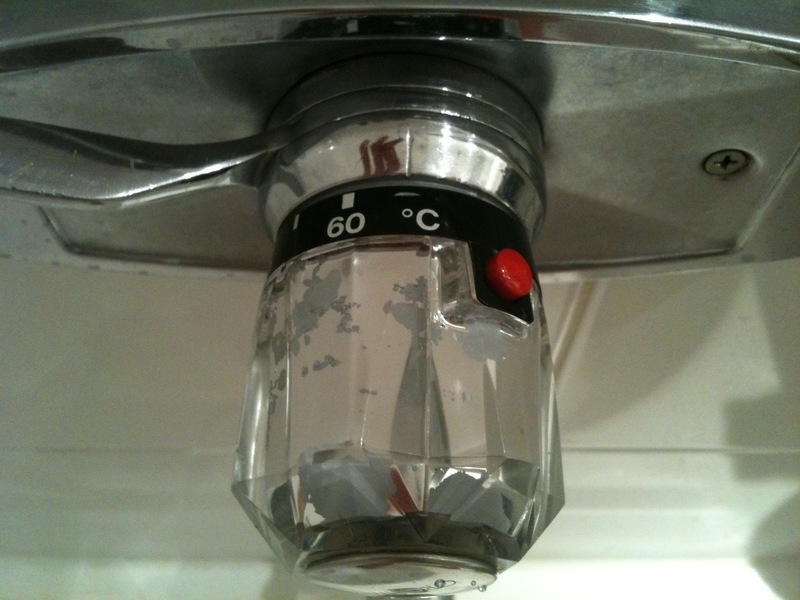 The red button shown has to be pressed whilst turning the tap to set the temperature above 38 degrees Celsius (body temperature). I originally didn’t notice this because the temperature was already set to over 50degrees (nobody would have a shower at 38degrees C – brrr!). Even when I turned the tap full circle either way, I depressed the button without knowing it. I have large-ish hands, so by grabbing the tap handle and turning it, I accidentally held the button in. In both cases, I could unknowingly increase the temperature to 70deg C (enough to scald) – negating the new design feature. Business requirement: The tap fitting has to be a single unit, using current parts to keep costs down. And hurry it up, we have orders to fill. Engineering-centric design: First, design the water-flow control. Put it at the back of the fitting, so it’s out of the way. A rotating lever will do the trick. Next, design the temperature control. We’ll just use one of our normal taps for that to keep costs down. Problem solved. Business requirement: Stop people burning themselves. Engineering-centric design: Add numbers to the temperature controller, so the users know they are turning the temperature up, not down. People are STILL burning themselves. Engineering-centric design: Add a button that has to be depressed before the user can move the water temperature beyond body temperature. People are STILL burning themselves, but our lawyers have said we’re OK because we’ve added enough features to try and counter their stupidity. This of course resulted in a complex, expensive design that still contradicts user expectations and is still a danger. Resulted in an unintuitive tap fitting that is dangerous to use. If the organisation had of done some foundational research to understand people’s mental models of how taps work, and designed for it, they would have saved on development time and product complexity, lowering the cost for development and production of each unit. Unfortunately, this is the type of development process that corporations encourage (the industrial, production line model: the underlying philosophy of corporations) – and the reason why there are so many bad designs out there. Can you imagine how much cheaper it would have been to do a bit of user research up front? Thanks for the post Ash, I wonder what was the reasoning behind the design. Product differentiation, efficiency, better control. I’ve since heard that this is a design common in some parts of North America (even though it breaks the Western cultural norms I mentioned) – and indeed I have come across this design before in Maryland. I would imagine that it was a business-centric decision. Perhaps the hotel was originally built by a North American chain, and sourced fittings from North American suppliers? Tonight I’ll update the post with something else I discovered when using the shower this morning: a ‘safety feature’ to compensate for the broken expectations!